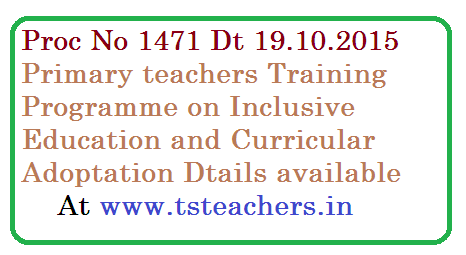 TSSA, Hyderabad – IE Wing – 2015 -16 – 5 - Days TOT at District Level for DRGs / MRG to train Regular Government Primary School Teachers on Inclusive Education & Curricular Adaptations from 03.11.2015 to 07.11.2015 and 5 – Day training to primary school teachers from 17.11.2015 to 21.11.2015 at Divisional Level – Reg. The Project Officers of Telangana State are informed that TSSA planned to organise 5 –day training programme to regular Government Primary School Teachers on Inclusive Education & Curricular Adaption as approved in AWP & B 2014 -15. In this connection, a 5 – days State Level TOT was conducted from 07.09.2015 to 11.09.2015 for SRG/RPs @ 5 per District. The SRG will provide training to DRGs / RPs at District level from 03.11.2015 to 07.11.2015. And Divisional Level Training will be provided to Primary School Teachers by DRG from 17th to 21st November 2015. The following measures has to be taken by DPO in conducting TOT at District level and 5 – day training to identified teachers. Teachers would be identified from Schools where more than 5 CwSN studying. Identify no. of Centres basing on the no. of teachers to be trained. All the identified teachers should be trained for 5 – days only from 17th to 21st November 2015 and each centres should have 40 -50 participants only. Each Centres required 3 RPs / DRGs to deal different categories HI, VI, Intellectual Disabled. Identify RPs among teachers or otherwise from Govt / Private Special Schools who are well qualified like with M.A. M.Ed / B.Ed and can train the teachers. Identify Good venue for accommodating 40 - 50 participants. Training should be in Non Residential mode only. MEO has to enter the participation of teachers in the service books of teachers, who attended the training as per the G.O cited above.